Local search metaheuristics have been developed as a general tool for solving hard combinatorial search problems. However, in practice, metaheuristics very rarely work straight out of the box. An expert is frequently needed to experiment with an approach and tweak parameters, remodel the problem, and adjust search concepts to achieve a reasonably effective approach. Reactive search techniques aim to liberate the user from having to manually tweak all of the parameters of their approach. 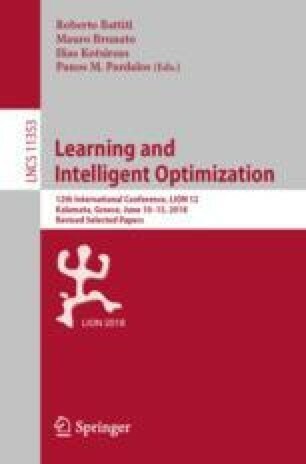 In this paper, we focus on one of the most well-known and widely used reactive techniques, reactive tabu search (RTS) , and propose a hyper-parameterized tabu search approach that dynamically adjusts key parameters of the search using a learned strategy. Experiments on MaxSAT show that this approach can lead to state-of-the-art performance without any expert user involvement, even when the metaheuristic knows nothing more about the underlying combinatorial problem than how to evaluate the objective function. The authors would like to thank the Paderborn Center for Parallel Computation (PC\(^2\)) for the use of the OCuLUS cluster. This work was financially supported in part by TIN2016-76573-C2-2-P.